Species In Genus: 1 sp. Etymology: (Greek: 1/2 belt or girdle, fruit 1/2 enfolded by phyllary) Note: Other taxa in TJM (1993) moved to Centromadia (spiny-leaved taxa), Deinandra. Habit: Annual 5--80 cm, often aromatic. Stem: +- erect. Leaf: basal and cauline, proximal opposite or in rosette, sometimes persistent, most alternate, sessile, 5--18+ cm, 2--8(12) mm wide, narrowly elliptic to linear or lance-linear, minutely serrate or entire, generally puberulent or coarse- to silky-hairy, distal often also stalked-glandular. 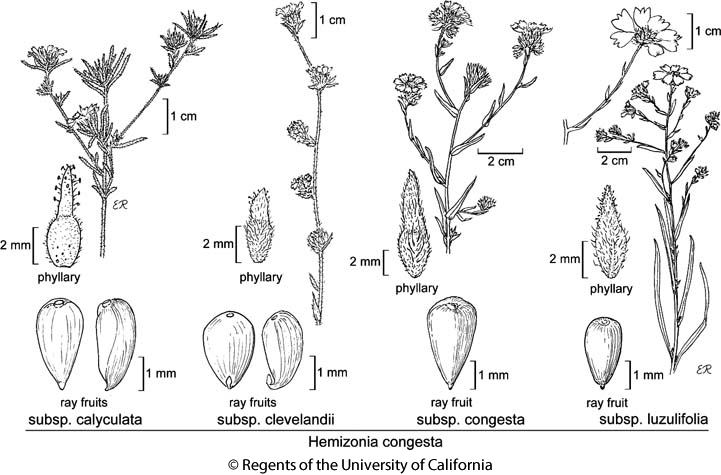 Inflorescence: heads radiate, 1 or in +- panicle-, raceme-, or spike-like clusters or in tight groups; involucre hemispheric to +- urn-shaped or spheric, 3--8+ mm diam (rarely subtended by calyx-like set of 5--7 bractlets); phyllaries 5--14 in 1 series, linear to lanceolate or oblanceolate, each generally 1/2 enveloping a subtended ray ovary, falling with fruit, 3.5--12 mm, coarse- or soft-hairy, stalked-glandular; receptacle flat to conic, glabrous; paleae fused, forming cells around each disk flower, scarious, +- liquifying. Ray Flower: 5--14; corolla white or yellow, ray 5--12 mm, often purple-veined abaxially. Disk Flower: 5--60+, staminate; corolla 2.5--3.5 mm, white or yellow, tube < throat, lobes deltate; anthers +- dark purple, tips widely ovate to ovate-deltate; style glabrous proximal to branches, tips lanceolate to awl-shaped, densely hairy. ; anther bases cordate-sagittate to sagittate. Fruit: ray fruit 2--3.5 mm, nearly round in ×-section (except +- flattened adaxially) or +- 3- angled (abaxially generally +- widely 2-faced, adaxially +- flattened to slightly bulging), glabrous, black, tip sometimes beaked, beak inconspicuous, straight, diam > length, pappus 0; disk fruit 0, pappus 0. Chromosomes: 2n=28. Leaf: short-hairy, +- shaggy, or silky-hairy, hairs not notably longer at margins on distal leaves; all or distal leaves glandular. Inflorescence: heads in panicle-like cluster; peduncle 0 or 1--30 mm, bracts not > phyllaries; calyx-like bracts subtending heads 0; phyllaries 3.5--6.5 mm, tips generally < bodies. Ray Flower: 5--11; corolla white, ray purple-veined abaxially. Fruit: width 0.5--0.6 × length. Ecology: Disturbed, open, or grassy sites, often clayey soils, serpentine; Elevation: < 1000 m. Bioregional Distribution: NCoRO, NCoRI, w edge n SNF, GV, CW (exc SCoRI). Flowering Time: Mar--Dec Note: Hybridizes with Hemizonia congesta subsp. lutescens. Citation for this treatment: Bruce G. Baldwin 2012, Hemizonia congesta subsp. luzulifolia, in Jepson Flora Project (eds.) Jepson eFlora, http://ucjeps.berkeley.edu/eflora/eflora_display.php?tid=102005, accessed on April 23, 2019. NCoRO, NCoRI, w edge n SNF, GV, CW (exc SCoRI). Markers link to CCH specimen records. Yellow markers indicate records that may provide evidence for eFlora range revision or may have georeferencing or identification issues. Purple markers indicate specimens collected from a garden, greenhouse, or other non-wild location.